And, the latest in the new homeowner saga, our AC is on the fritz. I kept saying to Mr. Ink “It’s so hot in this house! This house just does not cool down like my last house! There’s something wrong with this house.” Finally, late Saturday evening, I looked at the thermostat. Indeed, it was not cooling down. The house was hot, the AC not running. Mr. Ink fixed a fuse that made the system cycle air, but that didn’t cool down the home. Thankfully, the sellers purchased a home warranty for us, so we are now just waiting on the call that tells us when we can get something schedule. Unfortunately, we’ve also had some suddenly warm weather, so I suspect the company is inundated with calls at the moment, and it might be awhile. In the end, we didn’t spend a ton of time at the house anyhow. Mr. Ink decided to hold a garage sale on Sunday and we were certainly consumed with that. But we did really well! And we still have a ton of stuff to sell in that old house so we are going to hold another the last weekend in June. Then we will be free to do the final clean out of the house. For the next garage sale? I plan to bring more knitting. I did the bulk of the sitting in front of the cash register, so during slow times I could have been knitting. 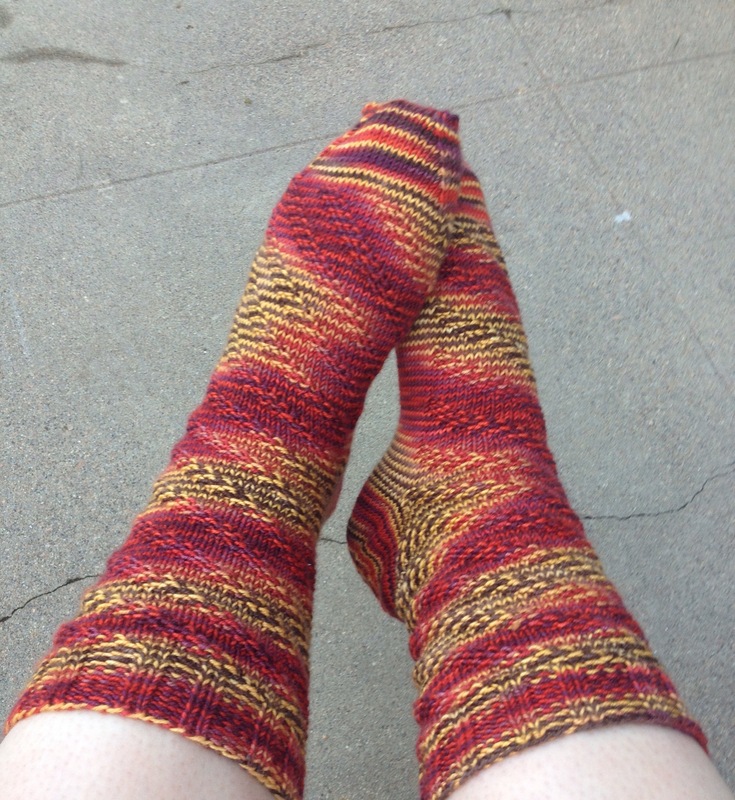 Except that I’d only brought my June socks, and those were less than an afterthought heel away from being done. You may remember that I finished the first sock way back in January or February, but then quit knitting on them due to other socks taking precedence. I’ve been about a month ahead of schedule on my one pair of socks per month all year. But….that ended this month. I just haven’t been knitting that much. These socks are knit out of Socks that Rock Mediumweight. They have an afterthought heel, and the pattern is RPM from knitty.com. One of my favorite patterns for mediumweight, and a favorite pattern for wintertime bike riding in particular. I think that July Socks are going to be two Christmas stockings. I’ve got two that I know I need to make this year, and it sure would be nice to have them done next month. Have a great week everyone, and stay cool!